Chicago is a land of weather extremes — with January’s freezing temperatures averaging well below freezing and its summers seeing temperatures consistently in the 80s. If you are a builder or property manager planning on construction services throughout the fall and winter, it will be important to consider the atmospheric conditions such as temperature and humidity to ensure a quality outcome. When it comes to drywall installation services, these two factors can play a major role in the beauty and integrity of each board. Relative humidity, absolute humidity, and the dew point can all affect the drywall’s finish, well as its long-term quality. For those looking for professional drywall contractors in Chicago, the AZ Drywall Finishing team is here to provide outstanding results regardless of the weather. We understand the Windy City’s intense fluctuations in humidity, and work hard to provide consistently ideal results on the first try. Today, we’ll discuss the impact that these environmental factors can play in your building renovation or building process. If you are looking for a quote, be sure to call our local drywall company today! Just like the soil and concrete beneath your building, the gypsum boards being installed on your frame will be impacted by changing temperatures. Science will explain this process with the speed and concentration of molecules — hotter weather creates more movement, causing materials to expand as a reaction. 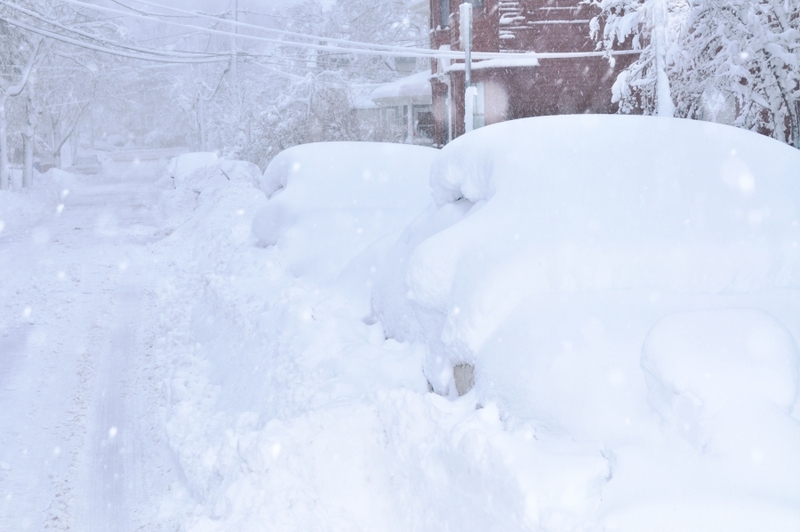 Colder weather creates the opposite effect, with components contracting as molecules lose their thermal energy. When it comes to drywall installation, your contractors will recommend working in more moderate temperatures. The closer your building’s interior is to the range of 65 to 70 degrees Fahrenheit, the easier your finishing process will be. Drywall can expand and contract during radical temperature shifts, and freshly installed boards will be more susceptible to damage. Drywall contractors have the experience and tools to create beautiful outcomes in colder conditions, but DIYers may face a plethora of problems. Cold weather also impacts the speed at which your finish coats can be applied. Hanging drywall in 20-percent humidity at 70 degrees Fahrenheit, for example, will yield a drying time of roughly 11 hours. If the temperature were to drop to 40, your drying time would be over three times longer! Humidity is the other factor in this tandem with temperature. 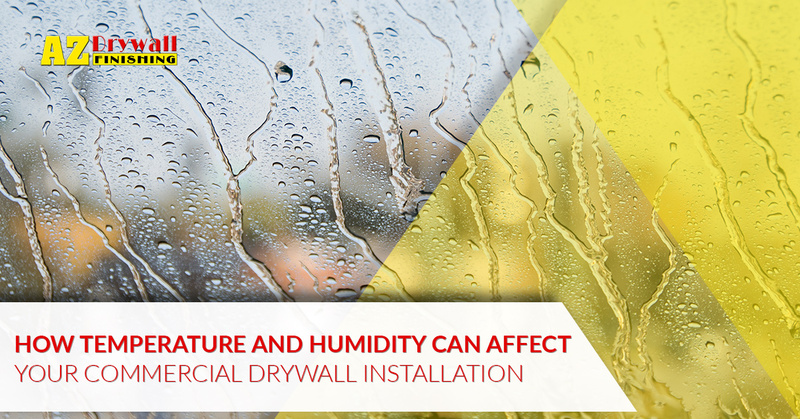 As the numbers above pointed out, humidity directly affects the curing time and quality of drywall installation services. Relative humidity is the measure of water vapor in the air relative to the temperature. It is also the term to describe how the temperature “feels” outside. This figure is expressed as a percentage relative to the maximum absolute humidity allowed in the air. If your relative humidity is over 90 percent, chances are that your project will be affected by considerable moisture concerns. That same drywall installation at 40 degrees Fahrenheit would take roughly 35 more days at 98-percent relative humidity than the drier 20-percent environment. This method measures the actual amount of moisture present in the air, regardless of the current temperature. By calculating your relative humidity in relation to the temperature, you can determine how much total moisture will be there during your drywall installation. Warm air has the ability to harbor more moisture, creating more moisture-intensive concerns in hotter environments. Heating a cold and humid room will increase the moisture storage potential, reducing the relative humidity. Heat – A heating element can be used to keep your building’s interior temperatures stable throughout varying weather conditions. Keep in mind, though, that too much heat can prove more damaging. Be sure to keep the temperature below 95 degrees Fahrenheit and do not place the heater so that it blows directly onto nearby surfaces. Ventilation – Proper air flow will do much to restore the curing conditions needed for your drywall installation. Ventilation helps to stabilize both the temperature and moisture conditions, and can help to reduce the vapors introduced by your heating elements. Acclimation – It will prove valuable to keep your project site at a consistently warm temperature for the best results. Many experts recommend heating your workspace to at least 50 degrees Fahrenheit, with two days of acclimation to provide the best conditions for installing drywall. AZ Drywall Finishing is here to provide top-quality results on each and every job we work with. Our team understands the complex dynamic between the weather, temperature, and humidity surrounding your drywall installation services. Our drywall contractors utilize accurate psychometrics to pinpoint the needs for your building, providing a quality result the first time. Contact us today to learn more about our commercial and industrial drywall services!